Bumblebee Loves You from HANDi on Vimeo. 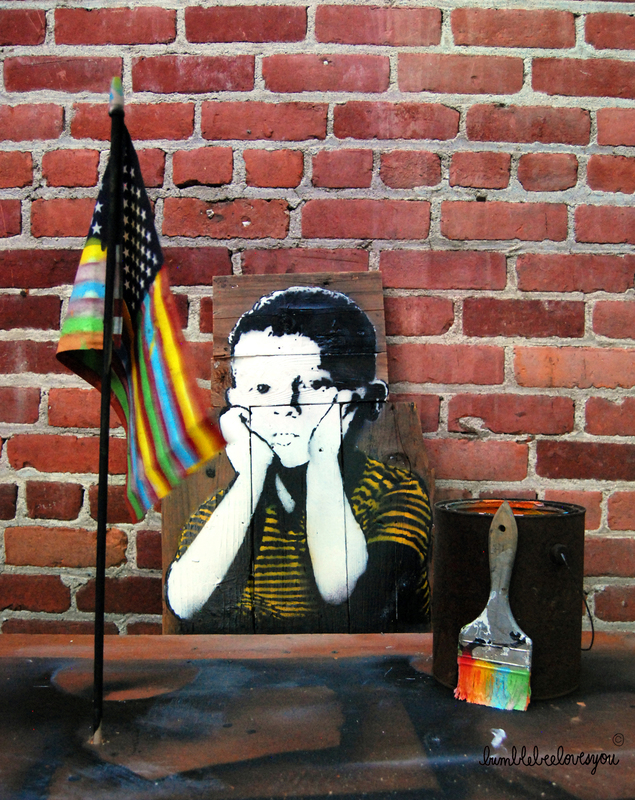 Born and raised in the southeastern part of the Los Angeles County, he uses the technique of stenciling and mixed media to create images of children on unloved walls of his hometown. Considerate and thoughtful, Bumblebee’s work also deals with issues such as child homelessness and the impact of modernity on nature. Despite the seriousness of his subject matter, his works are not heavy. Instead, they are whimsical, playful and exude a sense of childish innocence, freedom and joy. 2017: include the Long Beach Museum of Art and several on-site created pieces at Lancaster Museum of Art and History which include a new mural, larger than life canvas paintings & a ephemeral 35ft mural at the Brand Library in Glendale, CA paying homage to classic line work inspired by nostalgic children’s books. In 2012, a short film was made by Handi Films titled Bumblebeelovesyou.